Villa Abakoi is an expansive, ambient hideaway with six bedrooms in separate pavilions for ultimate privacy. Accommodating up to fourteen guests comfortably, Villa Abakoi is perfect for large groups or families looking for a lavish retreat in Bali. With a 16-metre swimming pool, numerous sun loungers and cozy nooks, Villa Abakoi provides a dazzling setting for ultimate relaxation and quality time with loved ones. The six bedrooms at Villa Abakoi are fully air-conditioned and spread out over two floors. The master bedroom is located on the ground floor in a separate, two-story pavilion and it does not disappoint. Spacious, stylish and with great views, the master bedroom is furnished with a king-sized bed, a flat screen TV and DVD player as well as a walk-in closet, a mini bar and a safety box for your complete comfort and convenience. The accompanying en-suite is marble throughout and contains a deep bathtub, rainfall shower, two washbasins and all the amenities to complete your picture-perfect stay. The remaining bedrooms are equally as stunning and comfortable, three more bedrooms can be found on the ground floor and two more on the first. All of the rooms are generously appointed but some also contain desks and additional seating areas. Three are furnished with queen-sized beds while one contains two singles. Children would love the coziness of the final room, which contains two bunk beds and is perfect for sharing. All of the bedrooms come with en-suites as grand and lovely as the one in the master bedroom. Scattered with interesting and exotic pieces of décor, the living room is both trendy and rustic. The dining table seats up to 8 comfortably and the high, pavilion-style layout and ceiling fans ensure a constant cool breeze. The living area is both spacious and snug: directly beside the dining area are two opposing couches and an armchair in a cozy nook that provides an intimate setting for relaxation. The open-plan style provides a gorgeous view and easy access to the oversized 16-meter pool that’s lined with palm trees and bougainvillea plants. The perfectly manicured lawn and charming lily pond simply add to the feeling of paradisiacal serenity. 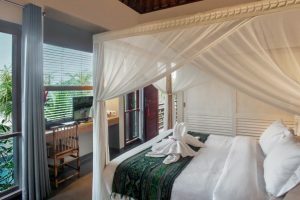 Guests can soak up some rays in one of the six sun loungers or unwind on the daybed and read a book in the shaded gazebo. Villa Abakoi is staffed with a Villa manager, a butler, a gardener and security. You may also request a babysitter, driver, chef, and masseuse or yoga teacher for an additional charge. The villa manager will be happy to answer any queries you may have or help with arranging trips and tours around the Island. Situated in the ultra-chic area of Seminyak, Villa Abakoi provides guests with convenient access to some of Bali’s most exciting venues. Whether you’re after a relaxing evening sipping cocktails and watching the famous sunsets at Ku De Ta, or dancing the night away at La Favela, you’ll definitely find your niche in Seminyak. On top of the buzzing nightlife, Seminyak offers visitors a divine gastronomic experience at numerous restaurants such as La Luciola or Sardine, as well as excellent shopping. Pamper yourself at a high-end spa like AMO or book a surf lesson if you’re looking for something a little more exhilarating. Hi Speed Wi-Fi in each bedrooms and villa. 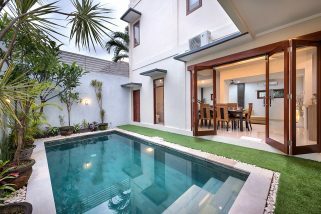 3 bedroom villa Seminyak, hidden away down a tranquil lane, easy access to excellent shopping and good quality restaurants. Villa Darma is perfectly located off Jalan Drupadi and provides easy access to ‘Eat Street’, where you’ll find a wide range of cafes, warungs and restaurants including famous names such as Ku De Ta, Chez Gado Gado, La Lucciola, Tulip, Kura Kura, La Sal and Lestari, Potato Head and Saigon just to name a few.